This story is an excerpt from Unwinnable Monthly #97. If you like what you see, grab the magazine for less than ten dollars, or subscribe and get all future magazines for half price. Have you ever attached a bouquet of knives to the barrel of a minigun? In Fallout 4, you can craft the Bayoneted Shredding Minigun with just a bit of steel, screws and adhesive. 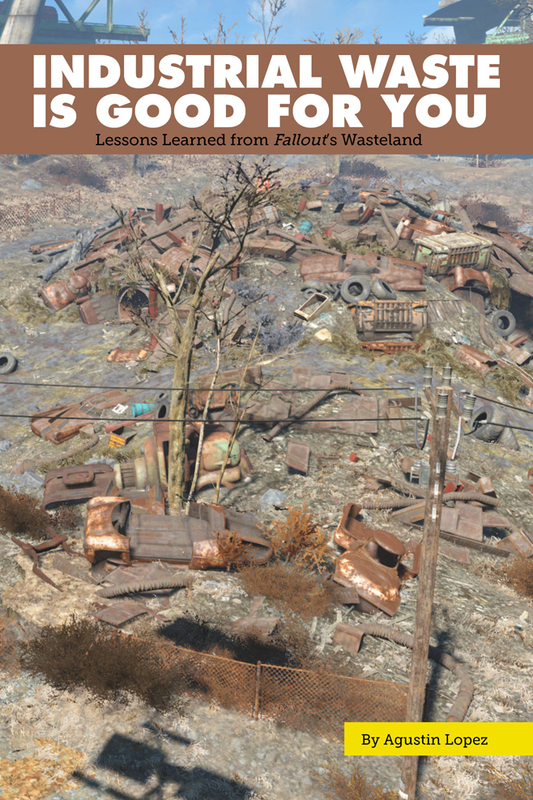 All it takes are the right resources and there is a surplus in the Commonwealth Wasteland. The post-apocalyptic wastelands in Bethesda’s Fallout series are heavily populated, not with people, but with items left behind from the pre-apocalypse. They were everyday goods mass-produced for mass consumption, like a bottle of Nuka-Cola or a Vault-Tec lunchbox for kids. After the nuclear annihilation of the United States during the Great War, large deposits of these goods remain untouched in the ruins of the country. Billions of consumers were killed, after all. The overabundance of old world items makes survival possible for those unlucky few who survived the blast and now live in a nuclear dust bowl. The benefit is obvious for scavengers who cannot farm their own sustenance. They rely on the countless Fancy Lad Snack Cakes and YumYum Deviled Eggs scattered across the wasteland, which is fortunately littered up to the horizon. Overflowing garbage bins and dumpsters, forgotten factories with overstocked shelves and derelict pantries for families of four – ironically, there is enough waste to sustain life. Yet, as you wander through vacant houses, you will find items that appear to be bona fide trash. Opening a metal container might net you a clipboard or an empty tin can. Unless you plan on taking notes, how could a clipboard help you survive? And why would Bethesda dedicate so much disk space to worthless junk? Once you activate a workbench, you start to understand the purpose of worthless junk. 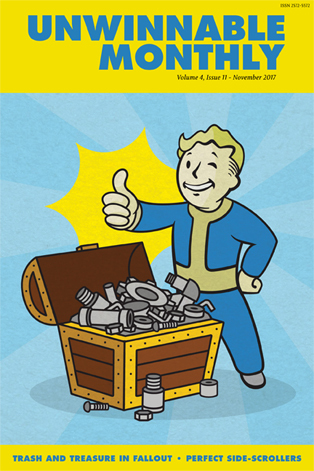 Crafting new items is one of the hallmarks of the Fallout series, known for its byzantine menu system detailing how you can re-appropriate clipboards and tin cans into something useful. In other words, one generation’s trash is another generation’s treasure. Fallout’s twisted economy proves that the value of a good is subjective, and thus, a tin can might have different meanings to different individuals and societies. This distinction is demonstrated in the Fallout: New Vegas add-on Honest Hearts. The main quest introduces a hunter-gatherer tribe called the Sorrows, who peacefully reap what they sow in Zion Canyon, while the nomadic White Legs tribe raids caravans and settlements outside of Zion to make a living. Both want to occupy the fertile canyon, but only the White Legs are willing to kill for it. The player is forced to make a choice: help evacuate the Sorrows from Zion and maintain their purity, or corrupt their culture and teach them warfare to protect their promised land. If you choose the latter, the Sorrows fully embrace their new violent worldview and learn to solve their problems with a trigger finger. The Sorrows never had much use for automatic rifles before the invasion of the White Legs since metal has no nutritional benefit, but, as mentioned earlier, an object’s value changes based on ever-shifting social forces. After you intervene in their conflict, the Sorrows’ demand for guns and ammunition skyrockets, continuing the trend that led to the apocalypse, even though they have already survived a generation without war. If their economy recycles old world artifacts, then it’s no surprise that settlers recycle old world ideas. I cannot blame them. In our own world, future settlers will build off the society we created for them today, and our foresight is questionable . . .
Agustin Lopez is an author, designer and educator living in Brooklyn, New York. He has been published in Motherboard, Thought Catalog and more. You can see his work at agustinlopez.com. 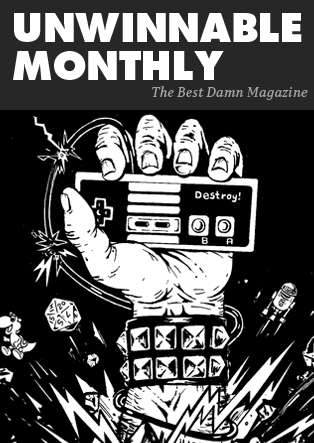 You’ve been reading an excerpt from Unwinnable Monthly Issue 97.